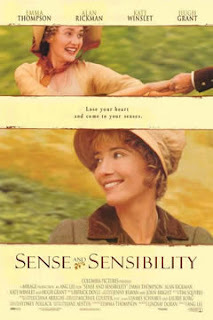 Tag line: "Lose your heart and come to your senses"
Based on the novel by Jane Austen, Sense and Sensibility tells the story of Mrs. Dashwood (Gemma Jones) and her three daughters, all of whom are mourning the death of their patriarch, Mr. Dashwood (Tom Wilkinson). Due to the strict rules of inheritance as defined by both law and tradition, the late Mr. Dashwood’s entire estate is passed on to his son, John (James Fleet), a child from a previous marriage, leaving the current Mrs. Dashwood and her offspring penniless, and without a place to call home. This harsh reality forces the Dashwood women to forsake London in favor of the country, where they settle down at the home of their cousin, Sir John Middleton (Robert Hardy). Unfortunately, one of the Dashwoods left more than luxury behind; Elinor (Emma Thompson), the eldest daughter, had fallen in love with Edward Ferrars (Hugh Grant), a romance that started to cool right after her sudden departure. Yet one sister’s loss is another one's gain, and once the family's settled into their new country cottage, Marianne (Kate Winslet), Elinor’s idealistic younger sister, finds herself juggling two suitors, rejecting the advances of the noble but boring Colonel Brandon (Alan Rickman) in favor of the unpredictable Willoughby (Greg Wise). Sense and Sensibility contains moments of charming simplicity, presented within the serenity of the English countryside, a contrast of sorts to the pomp and majesty one normally associates with England’s Georgian age. But as impressive as these contrasts are, they pale in comparison to the film's artistic style, and the manner in which director Ang Lee employs his camera to tell the story of the Dashwood women. In one incredibly realized, yet straightforward, sequence, Elinor receives word that Edward will not be coming to visit as promised. To take her mind off the disappointment, she tends to her sewing, seated at a table in the back room, as her mother, concerned for her daughter’s well-being, hovers nearby. The two women remain in position as the camera slowly moves backwards down the hall, framing mother and daughter in the doorway and stopping just in time to catch the wind as it blows a curtain in the front room. By utilizing depth of field in such a manner, Lee gives us a chance to take it all in, background and foreground, while making sure there’s plenty to see in both. It’s a beautiful scene, one of several to be found throughout the movie. Sense and Sensibility is a marvelous tale of love and loss in jaded high society, and boasts many exemplary performances. But it's also a stunning visual feast, not to mention a shining example of the art of film making at its most eloquent.